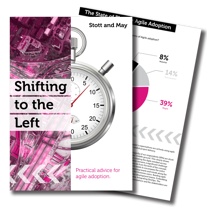 If Agile is the key to satisfying customer demand and creating first mover advantage, then why has it taken so long for organisations to implement it? This paper attempts to put this question under the microscope and help technology professionals, that are on the journey towards Agile transformation, understand the challenges ahead and develop strategies to overcome them. Our research is supported by a sample of 70 practitioners with hands on experience of Agile implementation (at various stages) with job titles ranging from: Directors Software Engineering, Heads of IT, Heads of Digital Engineering, Heads of Agile, Heads of Transformation & Integration, Development Managers/Team Leads, Lead Scrum Masters, Agile Delivery Managers, Agile Programme Managers, Product Managers and PMO Managers.